AS A KID growing up in Quebec, I fished for the following five species: bass, trout, walleye (or as the locals call it, dore), perch and northern pike. It wasn’t until many years later, during a trip to southern Florida, that I inadvertently landed my first barracuda: a solid seven-and-a-half-pounder that was so bait-obsessed it rammed the boat, twice, while I was reeling in to check my bait. I couldn’t get a proper look at the fish due to its thrashing and ripping about, but the moment I brought it on deck the only thing that went through my mind was “pike.” This fish took bait like a pike, fought like a pike, and pretty much looked a pike. From that moment on, I couldn’t help wondering if the two species were related. Science tells us of an evolutionary phenomenon called convergence, where two or more species show similarities in body form, life history and behavior resulting from similar environmental pressures. But how is it that these two different fish species, living in entirely separate and exclusive environments, show so many biological and behavioral similarities? In fact, many researchers suspect that somewhere in the ancient past, northern pike and barracuda must have been members of the same family. 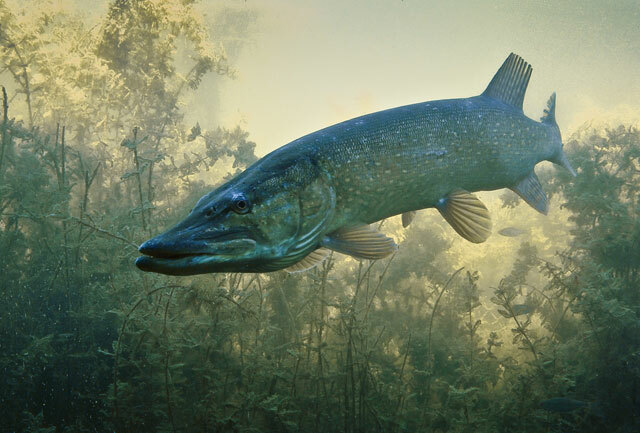 The Esocidae family includes large freshwater predators found in cold-temperate North American and Eurasian inland waters, such as the familiar northern pike (Esox lucius) and muskellunge (E. masquinongy). The various 18 to 20 types of barracuda (family Sphyraena), on the other hand, live in the warm, tropical waters of the Atlantic, Indian and Pacific oceans. They bear such a resemblance to pike and muskies that many historical texts refer to barracudas as pike-like fishes. Given their different environments, the northern pike and barracuda share a list of similarities surprising in its size and scope. Both are solitary, stalking predators at the upper levels of the food chain. Both mature at around two years of age, live to an average of 14 years, sport canine-like and conical teeth, hunt by sight, have nearly identical body shapes and share cannibalistic tendencies, even at a young age. Despite living in completely different waters, they prefer a strikingly similar habitat. They even stalk prey in the same fashion. Fish evolved more than 400 million years ago, but didn’t thrive until the placoderms (prehistoric creatures covered in bony plates and resembling fish) and large sharks began to disappear. “Modern” bony fishes appeared about 395 million years ago; the earliest forms lived in freshwater, meaning that saltwater fish evolved from their freshwater counterparts, and that barracuda evolved from the northern pike template. Fish did most of their evolving between five hundred million and three hundred and fifty million years ago, during the Silurian and Devonian periods. In the middle Silurian, the jawless fishes diversified, but it was not until the Devonian that a large variety of fishes really flourished and specialized in their respective aquatic niches. About 80 million years ago, the North American continent gradually drifted toward the North Pole. One species that was more tolerant of colder conditions evolved, eventually becoming the northern pike. Esocidae evolved from the herring-salmon order of fishes during the mid-to-late Cretaceous period, but developed a much more predatory bent. Pike jaws, in particular, developed to allow it to eat much larger food than the salmonids could handle. Barracuda followed a similar developmental pattern but became the pike’s warm water counterpart, explaining its much broader range, which now extends to nearly all the warm waters of the world. Barracuda and northern pike each benefit from a physical trait provided by evolution: long, skinny jaws. When viewed head-on, elongated jaws appear to disappear, so they aren’t visible against the greater circumference of the body, giving the illusion that the predator is farther away than it really is. Being able to approach prey head-on is a highly successful tactic for stalking predators. Pre-strike behavior is also similar; both barracuda and pike are not so much dependent on their sense of smell (like sharks, for example) as their sight. They hunt based largely on visual stimuli. So they orient most quickly to moving fish, as opposed to prey that’s sitting still. The parallels continue in the way pike and barracuda propel themselves. Ram feeding is the process in which a predatory fish uses a high-velocity lunge to overtake and engulf prey. Florida gar, redfin needlefish, northern pike and barracuda species are all ram-feeders that use their bodies in the same way, where the predator assumes an S-shaped posture prior to acceleration. This instinctive attack sequence is unusual in the fish world and only a handful of species have adopted it as their preferred strike pattern. Sometimes, being a well-armed predator that is able to ambush prey with lightning speed can come at a cost: there are several documented cases of pike choking to death after attempting to swallow fish as large as, or, on occasion larger than, themselves. Both pike and barracuda are sprinters, with torpedo-shaped bodies and fins placed well back on the body to maximize thrust. Their muscles are suited for rapid bursts of activity (contrast this with the muscle type that appears in many tuna species, making them “marathon” fish, able to cross entire oceans in record time). They also have more deeply forked and proportionately larger tails than slower species. The shape of these fish also suggests that they well suited to stalking prey in very shallow water. Pike are regularly found in weed beds, barracuda in mangrove beds. As is often the case with evolutionary convergence, behavioral similarities go hand-in-hand with physical similarities. “Nature’s evolutionary strategies are devised with a great deal more common sense than the ideas of man,” points out Bill Little, a writer for Esox Ecosse, a Scottish publication dedicated to pike angling. When it comes to barracuda and pike, he suggests, there is still a great deal of work to be done by evolutionary biologists, who are just beginning to refine their theories of evolutionary convergence. After all, species are normally defined as populations that are reproductively isolated from other populations; evolutionary convergence counters that reasoning. Prehistory has provided a partial answer: one template from which both fish evolved. Time has added another piece of the puzzle, with both species preferring similar, albeit exclusive, habitat. The barracuda and northern pike clearly demonstrate that living in dissimilar environments can—and often does—lead to species separated by both environment and millions of years actually looking and behaving identically.